The visitor is able to learn about the brutal murder of a king, mystery and intrigue, also the Berkeley links with early America, the famous Civil War damage which is not allowed to be repaired by an Act of Parliament and of course the need to keep such an historic building in a good condition. The family now live in one wing of the Castle and the rest is open to visitors. The Castle opened to the public 50 years ago as one of the first stately homes opened to the public when such a thing was almost unheard of. Now we face competition from many houses owned by the likes of the National Trust and English Heritage. But Berkeley remains in the family as it has been for the better part of 1,000 years. The Castle is now owned by a Charitable Trust and currently is in need of a great deal of repair mainly to keep the weather out. A target of £5.5m is needed and work will be done as and when funds allow. We have already repaired the Norman Arch which visitors walk through to gain access to the Keep and the Kings Gallery, where Edward II met his gruesome end with the red hot poker. But the Castle and accompanying Estate are not sitting back and waiting for money to come in. Two recent initiatives have been launched to generate much needed funds and publicity. The first is the sale of Estate venison to the public for the very first time. The Berkeley family have lived at Berkeley Castle and their sister estate Spetchley Park near Worcester, for 850 and 400 years respectively. In that time they have always maintained deer parks which have provided them with this top quality, healthy meat for generations. The deer are wild and have free roam of the parks. Queen Elizabeth I was one of many famous visitors to Berkeley, and on one occasion, famously over-hunted the Castle's deer. On gentle reprimand, she departed in a huff, leaving her silk bedspread behind which is now on display in the Castle. Venison is very healthy being iron-rich, vitamin-packed, protein-rich and low in saturated fats. Limited stocks are available so orders are being taken on a first come - first served basis for this wonderful meat - get your order in before 30th November for collection in mid December. The second initiative is the launching of the Friends of Berkeley Castle, primarily a supporters group whose aim is to promote the Castle, help out where necessary and have fun at the same time. There will be a launch evening at the Castle on December 11th when the recruitment begins in earnest. Benefits of becoming a Friend include free admission to the Castle, Gardens and Butterfly House, advance notice of special events, an invitation to an annual summer party hosted by a member of the Berkeley family, newsletter, discounts in the Castle gift shop and a free ticket to Spetchley Park Gardens. The really nice thing about the Friends group is that it has been organised by people who care about the Castle and decided independently of the Castle's ownership and administration to set up the group. They are a very welcome addition to the Berkeley Estate. What is it like working on the Estate? There is a large team of dedicated people who in the main centre around the Estate Office, who look after the Castle, farmland, and properties and no day can ever truly be said to be the same. With the tradition of Berkeley to maintain there is a real community feel about how the work is done and we are rewarded by being able to work in one of the loveliest areas of Gloucestershire. What more could anyone want from their workplace? 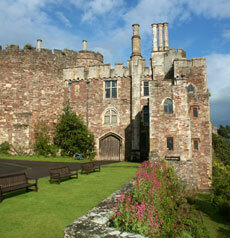 For more information on the Castle or to order Venison look at www.berkeley-castle.com, or telephone Tim Davies on 01453 810303.